Custom Engraving – Now Available!</p> <p> </p> <p>We have been working the highest quality solution to make this the complete package. Our laser engraving is a deep cut that is made to last. The finish is very detailed and allows for very crisp text on the stem. Checkout our store for engraving options. Constructed using laser cut stainless steel. 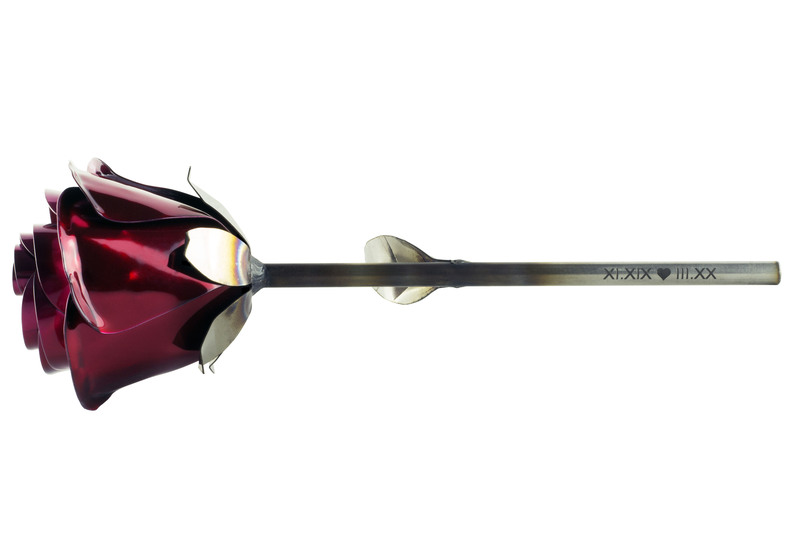 Each rose is uniquely engraved, precisely tig welded & bent into its final shape. This whole process is done by hand. Built to last forever. Tailored Supply was the original platform for products I created. Tailored Group was a natural stepping stone. The group of individuals around me that helped create this next iteration are just as important as myself. Years ago I tried to cop out of getting a girl flowers. My resolve was making something in the garage that would reduce my anxiety of following social norms to the tee. I will say my first attempt looked like someone threw up some metal, welded it with a potato, and never took the beer goggles off. Over the years I created products for cars, motorcycles and basically anything that needed fabrication. Now that I have help, I’m going back to the basics and giving another valiant attempt. We plan to create and release a lot of interesting products in the future, so stay tuned! We are only able to do this because of the amazing support we receive, so thank you. Most of the inspiration for this platform is doing the opposite of what is recommended. This is an escape from mass produced products with a short life span. It really has no agenda or end goal. Culture clash is the best description we have come up with. Personally, most of my inspiration is a wild melting pot of different styles, which change weekly and I never stop trying to mix and match till something sticks. We plan to have a section soon on our current projects and media we find fascinating. If you’re interested in getting involved, just drop us a line info@tailoredgroup.io. Patience. Each item is currently handmade from scratch. If you have any concerns or questions about this process, please email us at info@tailoredgroup.io. The entire rose is constructed out of stainless steel, which is very strong and resists corrosion. We tig weld each rose by hand. Since the flower uses such thin material, this is actually quite difficult and time consuming. However, it gives a great clean look and makes each rose truly unique. Yes, our poor hands get to bend, weld, and often fight with each rose right here in sunny California. We apologize if you find some blood or tears on your rose. We are always revising and improving. This is the third big overhaul to the rose line alone. We plan to bring more unique products to market very soon. Since each of our products is handcrafted, we generally sell out quickly or do limited runs of select versions. Please make sure to review each listing for more information when checking out. We offer a full line of custom finishes. Our colored options are done with high quality powder coat. We now even offer a deep polish for our candy line of powder-coated roses. Laser cut stainless steel rose. This variation features hand polished petals that are coated with a metallic pink powder coat. The base is untreated stainless steel with oxidized heat rainbows. Laser cut stainless steel rose. This variation features hand polished petals that are coated with a candy gold powder coat. The base is untreated stainless steel with oxidized heat rainbows. Custom engraving on the stem. Laser cut stainless steel rose. This variation features hand polished petals that are coated with a candy red powder coat. The base is untreated stainless steel with oxidized heat rainbows. Laser cut stainless steel rose. This variation features hand polished petals that are coated with a candy red powder coat. The base is untreated stainless steel with oxidized heat rainbows. Laser cut stainless steel rose. This variation features a high gloss red powder coated flower. The base is untreated stainless steel with oxidized heat rainbows. Laser cut stainless steel rose. This variation features a high gloss tiffany blue powder coated flower. The base is untreated stainless steel with oxidized heat rainbows. We offer a lot of variations of finishes. Please review all the items prior to checkout. We currently offer PayPal as our merchant. You can use all major credit cards or your PayPal account. Our checkout is fast and easy. Please do not be lazy and give up at this point. We get notifications and it’s just depressing. Well, unless we have a bunch of backorders. That would be ok.
We stepped it up this time and now offer a lot of international options. If you’re not included in our shipping list, please email us at info@tailoredgroup.io. We will do our best to make sure you’re taken care of. If your item is in stock we ship fast. I have two speeding tickets to prove it. We hope you truly enjoy the product and if the purpose is to get lucky, well, we hope you get lucky :). We ship all packages with USPS. Priority mail is our recommended service. However, we do offer First Class for some items. All billing and shipping is handled by PayPal. We do not keep any of this data. It's all handled by a secure third party (PayPal). Return any of our products–no questions asked–within 15 days of purchase. We just ask that you pay return shipping unless we made a mistake. If so, we will send you a label to return the item. Please email applications to info@tailoredgroup.io. Please note you're looking to be a retailer for our product. Thanks for the interest! © Tailored Group LLC - 2017. All rights reserved.